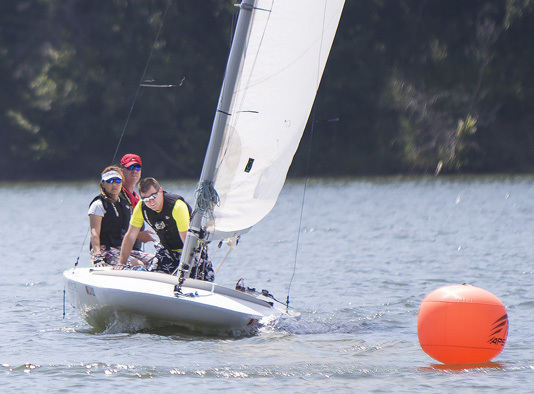 Many of the members and crews at Jacomo Sailing Club feel that sailboat crewing is one of the best deals in all of sailing. A crew does not need expensive equipment, sailing skills, or money for entry fees. From time to time all skippers at the club need crewmembers. You will not get rich but can obtain a can of beer after the race. The on the job training is always free and the excitement of sailing and competing is a blast. There are many ways that individuals can start racing and crewing on sailboats. Just start asking the members about how to contact skippers who need crew. We have many skippers who are looking for crew and several boats on which you can learn the ins and outs of racing and crewing. Just show up about one hour before the Sunday races (12:15). The club holds Sunday afternoon races, from May through October. The races usually start at 1:30, and boats sail from both Sailboat Cove on the East Side, and the marina on the West Side. The club welcomes all new interest, even if you have never sailed. Start asking around about who needs a hand. While this is best for a people with some experience, a desire to learn is the key element. Many club skippers are looking for crew.